The relocation of the F.A.O. Schwarz toy store in 1990 into this huge tower from across 58th Street at 747 Fifth Avenue was an exuberant salvation and partial redemption of the building, which was one of the most outrageously bad examples of planning in the city's history. 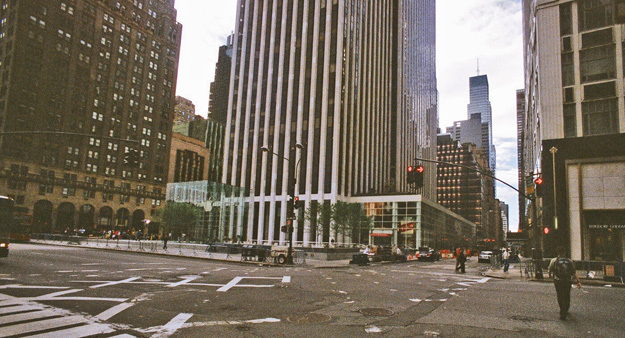 The full-block, 50-story General Motors tower, shown at the right in the center, replaced the Savoy Plaza Hotel, the original home in the city to Trader Vic's and, more importantly, a distinguished skyscraper hotel with a very large mansard roof that was the perfect complement to the Plaza Hotel, directly across the avenue, and Bergdorf Goodman, diagonally across the avenue. Together with the distinctive towers of the Sherry Netherlands and the Pierre hotels just to the north, this high-rise ensemble was the most elegant in the world and the most definitive part of New York after its skyline. It could almost be argued that it would have been better to replace the Plaza with the GM building than the Savoy Plaza in terms of urbanistic planning. Of course, the Plaza's interiors far surpassed those of the Savoy Plaza and its fame was wider. 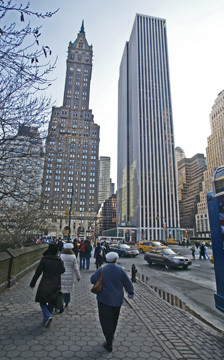 The sloping, black-glass tower at 9 West 57th Street, of course, gives some inkling of what a massive tower on the Plaza site might have looked like and because it is quite a distance away from Fifth Avenue the impact is somewhat mitigated. The GM Building actually tried to make some good urban design gestures; it set its great mass considerably back from the avenue to not block too many vistas of the great Sherry Netherlands Hotel spire (shown at the left in the picture at the left below), it opted for a bright white marble facade to maintain a sense of elegance and brightness; it created a broad and high arcade in front of its entrance; and it attempted to create a great public space in the tradition of the sunken plaza at Rockefeller Center. It also commissioned a “name” architect. Good intentions, of course, count for little in architecture, only good finished buildings and the result here fell short of the mark considerably. With its zoot-suit-like verticality, the tower, setback on a low-rise base that extends to the building lines on the sidestreets, but not on the avenues, is too prissy despite its angled piers and bay windows, which are almost too subtle and are lost in the whiteness. The building actually is not as bad as most critics have indicated and on another site, say, the Avenue of the Americas or Lower Manhattan it would most likely be praised as quite elegant. The GM office lobby is better than it appears, but not by much. Its stark, antiseptic whiteness is only slightly relieved by the golden cast of its large, globular chandelier made out of what look like car headlights. A closer examination, however, reveals that architect Stone tried to impose a coherent design based on octagonals to this building as reflected in its ceiling coffers and floor inlays. These are strong motifs, reminiscent of some of Frank Lloyd Wright's organic and Mayan ornamentation, but they are not clearly enough defined and become lost in the subtlety of their fine lines on the monochromatic white marble. The marble, it should be noted, is of very fine grade with little visible grain, which imparts coolness and aloofness. The Fifth Avenue lobby, behind a large and pleasant arcade, behind the project's sunken plaza, is also notable for its floor-to-ceiling marble grills that relate to the building's strong vertical emphasis on the exterior. Unfortunately the “lean and mean” corporate philosophy of the 90's resulted in the announced abandonment of the improved showroom by the automobile manufacturer altogether, once again reflecting corporate stupidity. (Almost at the same time, IBM announced that it would no longer support its Gallery of Arts & Sciences, which had quickly become the city's nicest and best museum space, in its building two blocks away on 57th Street and Madison Avenue.) In the 1960's, many planners lamented the conversion of much of Fifth Avenue's retail frontage to marble mausoleums for banks and airlines that were closed and dark at night, deadening the pedestrian environment of what was supposed to be one of the world's greatest and most exciting thoroughfares. New zoning discouraged such corporate huffiness and no doubt would have also banned car showrooms as incongruous and alien to the avenue's fashionable spirit, although in keeping with Mayor Guiliani's 1998 anti-pedestrian priorities (See The City Review article.) What the planners forgot, of course, was that big banks and corporations had more finances and staying power than most retailers and could therefore lavish greater expense on better, richer materials and the like, to create an even more impressive ambiance. The truth is that it is not the tenant mix that is so important as it is the quality of the design and inventiveness of the spaces. One would not pray for more car showrooms, but this revised showroom had become a plus and not a minus. Those with good memories will remember that an even more spectacular car-oriented space existed on this site, in a restaurant and bar, the Autopub, directly beneath this car showroom that opened onto the sunken plaza. It passed the way of all too many New York restaurants, into oblivion, but it was a very fun, exciting space with race-car banquettes and the like. The sunken plaza, scathingly detested by a majority of people with strong opinions in the city, is actually not so bad. Initially, it was pretty barren and there can be no argument with the fact that this particular site, the major gateway to Central Park and the city's most elegant heart, absolutely needed no plaza here, to say nothing of a sunken plaza, a type of space that has met with rare success because it requires extra effort on the part of pedestrians to reach and exit. What has been improved here is the installation of a lot of planting and a large outdoor caf�, and the placing of a wonderful street clock at the 58th Street corner heralding Schwarz's toys. The toy store, whose greatly enlarged and brightened store was the forerunner of the area’s tourist renaissance that soon followed with a new Warner Bros. Studio store one block to the south and other youth-oriented enterprises in the area, has now made this site intensely more trafficked with people on foot, the sure cure for any plaza of any type. Now all they have to do is regularly wash down the sidewalk particularly at the feet of the peddlers who have swamped it with their briefcases of cheap watches and the like. The souped-up, razzle-dazzle renovation of the car showroom unfortunately has not spilled over into the central office lobby, shown above in a photograph from the mid-1990s, but it is more in keeping with the supremely cheerful, flamboyant and fantastic lobby of the toy store, shown below, which should be off-limits to children of all but the supremely wealthy. The toy store, on the south side of the office lobby, is probably heaven. About the only part of the space that is not taken over by toys is the ceiling, whose octagonal designs are standard for the building's lobbies. The only trouble with white is that it conjures formica kitchen counters and bathroom tiles, not the traditional toy habitat such as a dark closet. Those who doubt that New York is special should come here at Christmas time in the very late afternoon when the giant snow crystal light fixture is placed over the intersection of Fifth Avenue and 57th Street and every child, of all ages, dreams of being able to romp inside Schwarz's. Our big, tall buildings of steel and granite and glass and concrete may not be always huggable, but real New Yorkers believe in magic. Stone's massing of the tower sought to mitigate its giant size by making it widest in the middle of the block to present narrower facades on the avenues. The trick works, but only a little; it's still a monster. The bay windows are a nice touch but are lost to the observer outside the building because of the building's scale. The white marble has held up well and it's a shame it does not grace a more graceful tower. In her wonderful book, "Will They Ever Finish Bruckner Boulevard, A Primer on Urbicide," (A New York Times Book, Collier Books, 1972), Ada Louise Huxtable, then architecture critic of The New York Times and now architecture critic of The Wall Street Journal, (see The City Review review of her latest book), observed that "Under their seven-eighths-inch marble veneer those fifty-story hexagonal piers are actually hollow, bearing concrete columns carrying service ducts, a functional solution that frees the building's periphery of columns behind the windows and integrates services with structure." 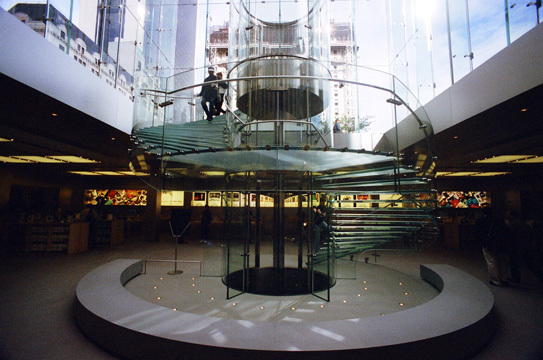 "Beneath the curious mixture of small-town department store and styling section d�cor is the kind of breath-taking skyscraper shell balanced in space that modern technology makes possible....Inside the building there is wall-to-wall marble. The Parthenon has come to General Motors. Pentelic marble by the ton from the same Greek quarries that supplied the Acropolis lathers the lobby walls; the rejects are upstairs. It is good to keep thinking of the Parthenon or one begins to link of luxury lavatories," Huxtable continued. General Motors, of course, does not have its corporate headquarters here but in Detroit and for many years it occupied a building named after it on West 57th Street. From Upper Madison Avenue, this white elephant stultifyingly dominates all vistas to the south because of its broad east-west slab. 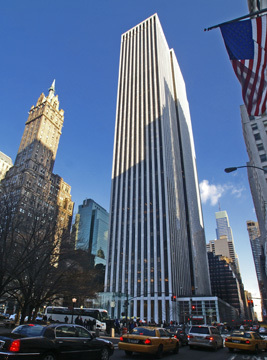 Seen from across Fifth Avenue, its narrow north-south facade is soaringly impressive, and would not fare too poorly in comparison with the view of 30 Rockefeller Plaza from directly across Fifth Avenue. It's a travesty to have lost the Savoy Plaza. It's also terrible that this building has a flat roof and did not aspire to carry on the skyline tradition of wonderful tops in the this area led by the adjacent Sherry-Netherlands Hotel and the nearby Pierre Hotel. The Savoy Plaza, of course, had replaced the Savoy Hotel. "As early as 1870, Boss Tweed had decided that the site was the finest in the city for a new hotel and for the investment of the loot he had acquired during his reign as lord of the city treasury; he began excavations for a building he planned to call the Knickerbocker. Tweed's fall meant that The Knickerbocker never got built. The plot remained a vacant eyesore until the twelve-story Hotel Savoy, designed by Ralph S. Townsend, was built and opened in 1892. The public rooms were embellished with an array of marbles that must have been absolutely dazzling....Although referred to as a hotel, the Savoy was actually a luxury apartment house with more-or-less permanent residents. These included in 1914 Charles H. Hayden; Roland F. Knoedler, the art dealer; and Mrs. Rhinelander Waldo, who had just built an extraordinary Renaissance house on the southeast corner of Madison Avenue and Seventy-second Street but did not live in it." A few months after putting up his billboards announcing plans to redesign the plaza, Donald Trump put his last name in large, very brassy letters at the corners of the building's low-rise wings and on the columns of its main Fifth Avenue entrance, as shown above. The former, smaller signs were chutzpah. The latter is really garish and inappropriate! In early November, 1999, Trump removed the signs from the low-rise wings, but the larger sign remained. 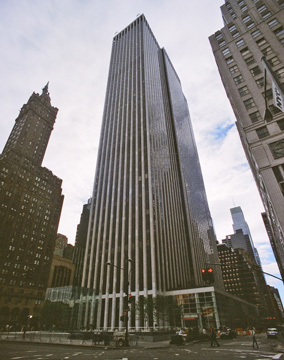 In June, 2003, however, the "Trump" name came off the building altogether in the wake of the building's sale. It was acquired by Macklowe Properties for a price reported to be about $1.4 billion. (6/25/03). The building's sunken plaza will be largely filled in to create more retail space and to create a sculpture garden on the roof of its entrance pavilion. A June 30, 1999 article by David W. Dunlap in The New York Times reported that "each side of the pavilion will be a 65-foot-long fountain, similar to those at the Metropolitan Museum of At." "Beyond the fountains will be small groves of trees, perhaps pear or hornbeam and marble benches," Dunlap wrote, adding that the plaza is being redesigned by Leclere Associates and Thomas Balsley Associates. The redesigned area will create about 10,000 square feet of additional retail space for the building and Dunlap reported that because the space is technical below grade it is not counted in the building's zoning calculations. In 2004, Harry Macklowe bought the building for about $1.4 billion. The F. A. O. Schwarz toy store closed for about a year but reopened in late 2004. 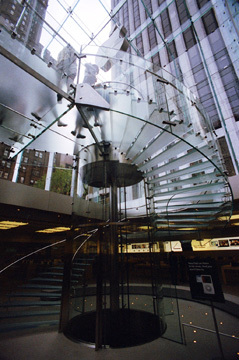 In a March 2, 2005 article in The New York Times, David W. Dunlap reported that the Macklowe organization plans to install a 32-foot glass cube in the building's Fifth Avenue plaza that will serve as an entrance to below-grade retail spaces much like I. M. Pei's famous glass pyramid serves as an entrance to the Louvre Museum in Paris. "The new plaza will be on a single level from 58th to 59th Streets, framed at each corner by low-wide, L-shaped parapets," wrote Mr. Dunlap, adding that "two shallow pools will flank the cube." Dan Shannon of Moed de Armas & Shannon is the designer of the new plaza. At the same time, the building is extended its base 10 feet along Madison Avenue to create a two-story retail space. In his article, Mr. Dunlap provided the following commentary about the new plaza plans: "With an evident passion for architecture, Mr. Macklowe thought first of modifying the existing retail entrance with a crescent recalling Norman Foster's Canary Wharf Underground station in London. He solicited ideas from Santiago Calatrava and from Mr. Pei, raising the prospect of a Louvre-inspired design. As Mr. Shannon recalled, Mr. Pei demurred, saying the Pyramid could not fit on the G.M. Plaza. To which Mr. Macklowe answered, "I'm only speaking metaphorically." Given the nice crispness and clarity of the "cubre" and the snappy design of the i-pod, the new Apple store itself beneath the cube is quite a disappointment. It is minimal and relatively spacious but bland and uninteresting.